While I was on my trip to Africa, we took a day trip from our main stop in Outapi, Namibia. This was my first view of the Kunene River which borders Namibia and Angola. The picture just doesn't do that view true justice. It was so serene and beautiful. 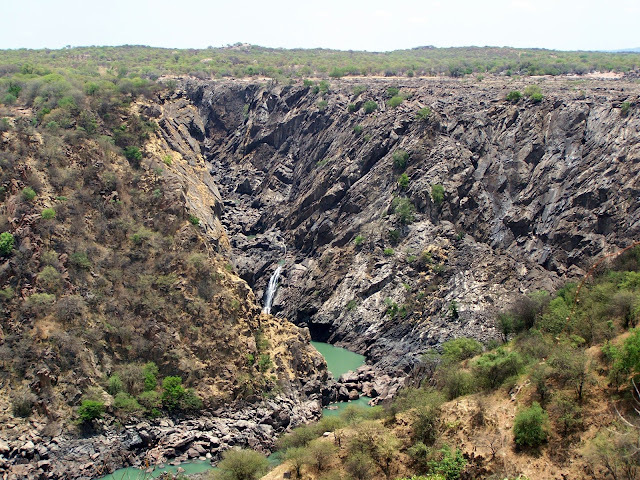 We made a stop at Raucana Falls located on the Kunene River. Unfortunately we didn't get to see it at it's most impressive time when water is flowing full force over it's edge. We did get to see a tiny bit of waterfall down near the base of the mountain. It looks really tiny here but this is actually quite large. I can only imagine how huge it would be when flowing full force from the top. I was amazed at the color of the water. It appeared to be a green color. I am sure it probably had something to do with the type of rocks in the river. It was quite beautiful. Here is a view of the entire cliff face where water flows during the rainy times. We loaded up and headed off to see more sights. Can you see the rough spots over to the right of this picture? That is smooth compared to how rough this road got. The dips and bumps became so rugged in spots that our men had to get out and help guide the van over them. I couldn't even take pictures it was so very rugged. We finally made it over the rough patch and then we were facing this. It doesn't look like too much does it? It is amazing how much bigger it got as we came closer to the crossing. I must admit that I was a bit concerned. I wondered how the headlines would read back home if we floated off down the river or who would come help us if we got stuck. Thankfully we made it across with no problem. After a bit more driving we finally turned off into the Kunene Island Campsite. They kindly allowed us to stop for a picnic and a bit of respite. I was surprised at how similar the campsite was to those found in the United States. It was actually quite nice. Some of our bunch decided to play a little in the water. I decided it was much safer to stay on shore. There are crocodiles in that river and that is Angola on the other side. Thankfully everyone made it back safe. This is a view of the shower house/bathroom for the campground. I bet you are wondering what type of facilities they have in Namibia. They had tents that look just like the tents that we use here in the United States. Here is a peek inside the shower house. I thought it was quite nice and even pretty in a rustic kind of way. The roof was really impressive to me. I wouldn't have a problem taking a shower here. And just in case you were wondering, yes, they do have modern toilets (and toilet paper too). The only difference was that theirs had a push button instead of a lever. We finished our picnic and packed up for the trip back. Along the way, we came upon some Himba tribesmen. They were herding some cattle. 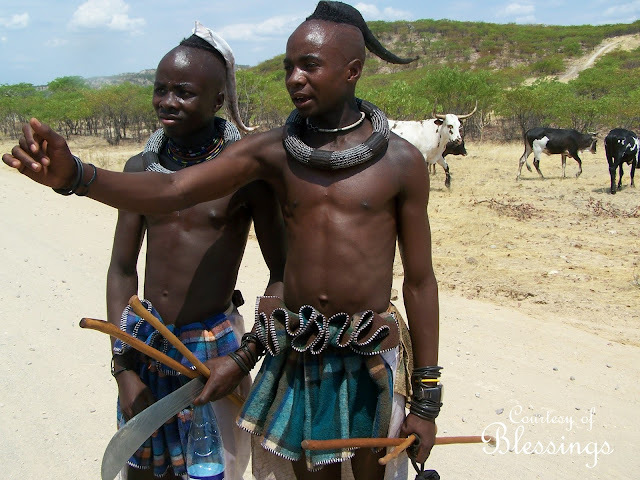 The Himba are quite good cattlemen. They herd their cattle by whistling. It was quite warm that day so we stopped and gave these men our extra sandwiches and water. In Namibia it is considered quite rude to take pictures of the people unless you ask first. We found that they are almost always glad to pose for you and let you snap pictures when asked. The Himba expect to be paid or given something in exchange most of the time. It is one of the ways this people group has found to help provide for their families. 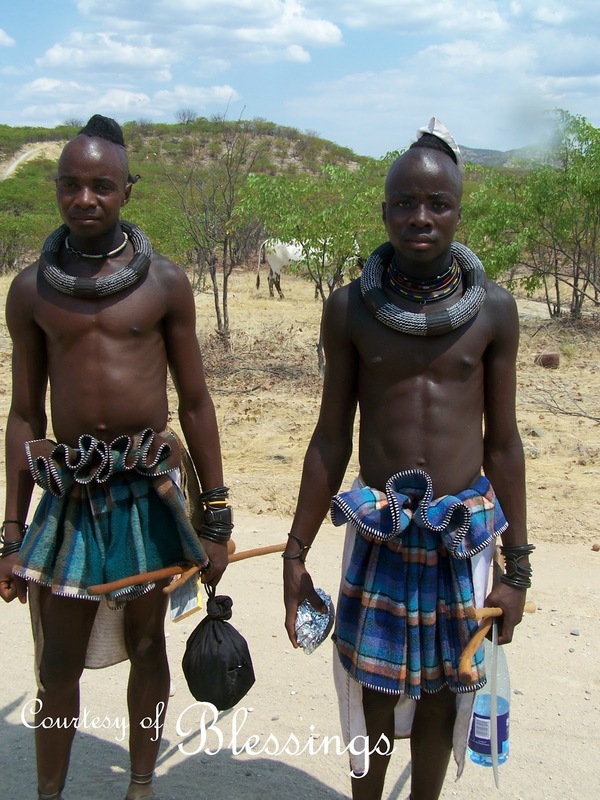 If you are interested you can read more about the Himba people here. There are also some great pictures to see here. I must warn you though that the women by custom do not wear clothing on their top half and so don't go to either sight if that is offensive to you. I hope you enjoyed coming along on our little day trip around North Namibia. Thank you for sharing these photos. I will never be able to travel the world and appreciate you letting me do it through your photographs.